A Vietnamese prisoner was able to freely update his Facebook page with statuses and photos from his jail cell, and is now facing punishment, police said Friday. 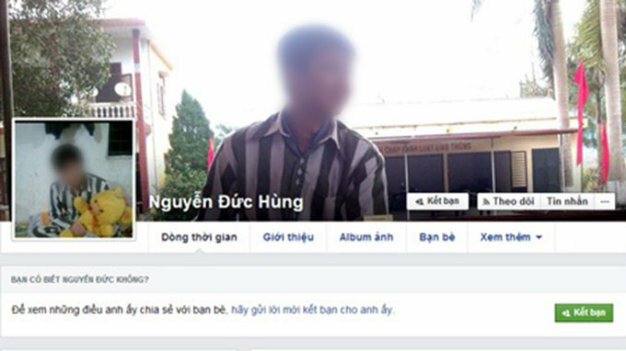 >> Facebook rolls out 'privacy checkup' Nguyen Van Ninh, deputy head of the General Department of Criminal Verdict Execution and Justice Assistance, under the Ministry of Public Security, on Friday told Tuoi Tre (Youth) newspaper that Nguyen Duc Hung, a prisoner at Tan Lap Prison in the northern province of Phu Tho, published personal images on Facebook. The confirmation came after people noticed the images posted on the social network by a prisoner. A Facebook user named Nguyen Duc Hung posted many pictures of prisoners and daily activities in prison, including prisoners talking on the phone or eating and drinking in the cells. There were also images of tattoos and a substance that was confirmed to be opium on Hung’s account. After investigation, concerned agencies confirmed that Nguyen Duc Hung used phones illegally while in prison, Ninh said, adding that competent agencies will take disciplinary actions against him. Other investigators are working to clarify why these images were still on Facebook in early September, the official said. Recently, the Phu Tho Province Police’s investigation agency indicted 51 defendants, who were the prisoners at the same prison, for colluding to trade drugs in the facility. The case will be tried by the end of the year, the provincial police said. During several recent examinations, police also seized 30 mobile phones, 15 SIM cards, 188 razor blades, and 11 used syringes and injection needles in Zone 1 of the prison alone. Another incident took place at the same prison in late 2013, when police found a number of prisoners illegally gambling on lottery.